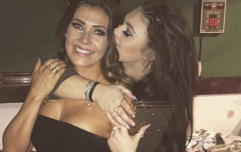 Corrie star, Kym Marsh, has paid tribute to her late son, ten years after his death. Little Archie, Kym's first child with ex-husband Jamie Lomas, was born 18 weeks premature at 21 weeks, and died moments after birth. The actress, who is soon to become a grandmother, posted a heartfelt tribute to her son on Instagram. "10 years on and it still hurts like it was yesterday," she said. "I wish I could show you a photo of a smiling boy surrounded by gifts. I wish I could show you videos of his party, playing with his mates and eating sweets until his tummy hurt." "I wish I could show you photos of us all celebrating his birthday with him front and centre blowing out his candles. I wish I could kiss him and say happy birthday son. I wish I could hold his hand again just for one minute. I wish for so many moments I can't have." "I may not be able to hold you Arch, or give you kisses or tell you that mummy loves you more than you will ever know. But you are in my heart always." "I will never forget you or stop loving you or stop missing you or stop wishing you were here. Happy birthday my angel. Fly High up there kid. I love you always and forever. Mummy xxxx." Along with this heartbreaking message, Kym shared momentos, such as her son's urn and his tiny footprints. Kym is also mum to David, 23, and Emily, 21, with former partner Dave Cunliffe, as well as another child with Jamie, 7-year-old Polly. We're thinking of Kym today.